What are spam outbound protection general recommendations? How to prevent outbound spam? Use SpamExperts Email Security extension as the most powerful tool against spam. This is the recommended solution by Plesk. Here is the instruction on how to install it. 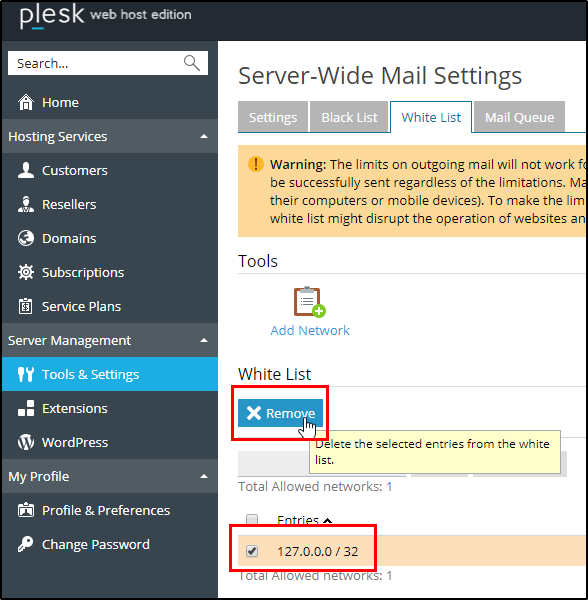 Remove 127.0.0.0 / 32 via the tab Plesk > Tools & Settings > Mail Server Settings > White List. Note: Mailing Lists will be unavailable with removed localhost from White List. If qmail is used: Many email messages are sent from PHP scripts on a server. How to find domains on which these scripts are running if Qmail is used? If postfix is used: Many email messages are sent from PHP scripts on a server. How to find domains on which these scripts are running if Postfix is used? Set more secure passwords for all mail accounts.